Global Vision 2000 is pleased to notify all our members that as part of our new strategy to Move Towards the Universal Paradigm Shift and Building the Century of the 5 Cs we are starting to move to our EZ XPO VIRTUAL EXPO. The need for this forum will no longer be required similar to the transition from moving away in transportation from the usage of horses to the car. ALL registered forum members are requested to sign up as ATTENDEES at the Global Vision 2000 IBC network. You will be able to do so freely. The url link is the gateway and all that is required is online registration with your name, email and password. What this means is a massive upgrade into the Virtual Reality and Artificial Reality world. This offers features such as realtime live engagement, a networking lounge and live chat facilities. This is in addition to the digital content on the forum. Thereafter we will soon announce the activation of our IBC AUDITORIUM to broadcast videos. Welcome to the new world of IBC Virtual Expo and we look forward to meeting you as we are gathering our supporters to join us on the journey on the road to Moving towards the Universal Paradigm Shift. We have the Universal Vision, Message and Direction and all we need is for you to catch up and join us. The time to move onwards and upwards has come or be left behind. Global Vision 2000 the UK based independent Islamic thinktank and business consultancy has evolved and after 16 years of research, development and advocacy is launching our new website with the birth and inauguration of the Islamic Business Channel – IBC. We are pleased that this was done on ISRA MIRAJ the Night of Ascension which took place on Monday April 24 2017/Rajab 27 1438. The purpose of the IBC is to accelerate all businesses, social enterprises and agencies to make the transition to and building of a fairer and just world. This is what we mean by our slogan referring to Moving towards the universal paradigm shift. This can only happen by building a global alliance and coalition with a collaborative ecosystem of networks working in a spirit of partnership and transformation for the Common Good. The IBC is a digital platform to build the Century of the 5 Cs- Consciousness, Connections, Communications and Communities of Collaboration. The IBC is committed to working with all stakeholders who seek not only a sustainable world but one which is fair and just for all. Only after releasing human potential can humans realise becoming vicegerents. The IBC is a digital platform which will work with Islamic tv channels and others to promote our community for all businesses and entities committed to universal values of economic justice and fairness. The IBC is committed to building a debt free and usury free world in which the global commons is shared equitably. “The Middle Nation to uphold good and stop evil”. The IBC is committed to working for a world in which Islam and Muslims are living, working and trading as equal partners with others in our global village. At a time of the rising spectrum of terrorism and extremism of all types in all nations we need solutions that eradicate root causes which are not being addressed. It is clear that debt, poverty, crime and violence go hand in hand and if our times need any war it has to be to eradicate these. The IBC believes that the current global financial and economic world is fundamentally flawed. The pyramidical system is designed to prosper the few, is fundamentally unstable and in which injustice is structurally endemic and subject to cycles of boom and bust followed by war. The bad news is other bubbles will burst and we are in the lull before the next global crash. We are living in an upside down world and there is an urgent need for a balanced moral political economy meeting the needs of people and planet. The Great Unwind of 2007-8 has morphed from a financial crisis into an economic crisis into a political crisis. The good news proclaimed on the day of Isra Miraj is that the IBC is committed to offering knowledge, solutions and a digital platform for its community to solve problems ravaging humanity based on the universal Islamic values of ADL – compassionate socio-economic justice. It is time to join and support IBC and its community on this long journey. THE CHANGE THAT PAKISTAN AND THE UMMAH SEEKS AND WILL MAKE THE WORLD TAKE NOTICE INSHALLAH. THE SACRIFICES OF INDIAN MUSLIMS OF THE 20TH CENTURY NEED TO BE REALISED FOR THE MASSES NOW. THIS MEANS THAT THE TIME TO REMEMBER AND ESTABLISH AN ISLAMIC WELFARE STATE AND AN UNITED STATES OF ISLAM UPHOLDING THE SOVEREIGNTY OF THE KHILAFA HAS ARRIVED. AS THE WINDS OF CHANGE ARE BLOWING IN THE EAST THE TIME TO MOVE THE STRANDED SHIP OF GLOBAL ISLAM HAS ARRIVED AS THE TIDE OF HISTORY IS COMING IN. WE ARE PLEASED THAT OUR FORTHCOMING EDITORIAL WILL OUTLINE THE PRE-REQUISITES AND MANIFESTO FOR THIS TRANSFORMATION . OFFICIAL PTI VICTORY SONG 2018 "INSAF KI JEET "
BRITISH COLONISATION: A LASTING IMPACT ON GENERATIONS? REVOLUTION KICKSTARTS IN ISLAMABAD. THE BATON TO LEAD THE LONG MARCH STARTED BY MUHAMMAD ALI JINNAH- QUAID I AZAM HAS BEEN PASSED TO IMRAN KHAN- CAN "KAPTAN" DELIVER? CAN THE NAYA PAKISTAN MODEL BE EXPORTED ELSEWHERE? THIS WILL BE ANALYSED IN FORTHCOMING EDITORIALS. IS IMRAN KHAN UP TO THE JOB? WHAT IS PAKISTAN’s CURRENT ECONOMIC CRISIS AND HOW IMRAN KHAN GOVERNMENT IS GOING TO TACKLE THIS ? GLOBAL VISION 2000 SALUTES AND CELEBRATES THE SPIRIT OF THIS OCCASION BUT WHERE IS THE FORCE TO DEFEND GLOBAL ISLAM AND MUSLIMS ? A ceremony to commemorate Pakistan's 53rd Defence Day and pay tribute to the martyrs of the 1965 war was held at the General Headquarters (GHQ) in Rawalpindi. Prime Minister Imran Khan accompanied by First Lady Bushra Imran was in attendance along with Army Chief General Qamar Bajwa and other civil and military leaders. Also in attendance were school children, family members of the martyrs and people from different walks of life, including parliamentarians, media representatives, celebrities and sportsmen. Addressing the ceremony as the chief guest, PM Khan mentioned that Pakistan Army was the "only institution (in the country) that works on the basis of merit". "We will bring this meritocracy to all fields in the country in order to help us prosper as a nation," the premier vowed. The prime minister also mentioned that all fields in the country including agriculture will prosper once we develop a strong rule of law in the country. PM Khan took advantage of the occasion to clarify that there was no such thing as civil-military tension, "there is one common goal, that is to solve the problems of this nation". “This nation will rise when the poor man knows that his son is getting quality education on the state's expense and that education will open opportunities for his son to achieve success in life. That is when the common man will want to become part of this system and own it,” the prime minister said. “For the past three weeks, I have been seeing presentations on all the problems that this country is facing, and I can tell you this that we will become a nation and rise again. We can overcome these problems once we strengthen the rule of law in this country," PM Khan said. Going back to the history of Islam, PM Khan said that we need to look at the way Prophet Muhammad (PBUH) brought together different tribes to form a nation. “We need to look back and see what Prophet (PBUH) did in order to bring those people together to form a nation so strong that they ruled the world for centuries." "All of you gathered here today gives credence to the fact that we are all united in our efforts to defend Pakistan," said Gen Bajwa while addressing the ceremony. "September 6, 1965, is an important day in the history of our nation. It is the day when the armed forces, with the full support of the nation, defeated an evil adversary. Every Pakistani was the nation's soldier. We were all united to defend our country and played our respective roles. Our soldiers jumped into the fiery pits of warfare but did not let our nation be harmed," he said, adding that the bravery shown by our nation during the 65 war serves as an important lesson and an inspiration to our youth even today. "We have learned a lot from the wars of 65 and 71. We were able to further strengthen our defence forces in the wake of these wars. Despite difficult economic times, we were able to become an atomic power. "Then began the period of non-traditional warfare. Over the past two decades, a wave of terrorism swept the world. The characteristics of war were forever changed. Unfortunately, Pakistan also found itself in the crosshairs of this new war. "Our armed forces and the entire nation have learned much during their service to Pakistan. Fear and terrorism were thrust upon us. Our homes, schools, places of worship, recreational sites and national institutions were attacked. "Efforts were made to weaken and divide us from within. But I salute all the citizens of Pakistan and the ones safeguarding our nation who fought remarkably in these difficult times and stood against such elements. "We have all successfully fought against this extremist narrative. In this war, more than 76,000 Pakistanis were martyred or injured. To remember these sacrifices we not only celebrate Defence Day but since 2014 also celebrate Martyr's Day. "We have sacrificed a lot but our job is not done. The war is still ongoing. We have yet to reach the pinnacle of peace. We have to make Pakistan reach a level where no one can look at us with an evil intent," Gen Bajwa said in his stirring speech. The army chief went on to say that for the country's stability and progress, democracy is of utmost importance. "Democracy cannot blossom without observing the democratic traditions in true spirit and without the strengthening of institutions," he maintained. "We have set on this path ten years ago," he said adding that: "Today we are more united and more resolute. This is a message that Pakistanis are not ones to fear any crisis and will soar to new heights soon." Prominent politicians including Foreign Minister Shah Mehmood Qureshi, Defence Minister Pervez Khattak, Railways Minister Sheikh Rashid, Information Minister Fawad Chaudhry, PML-N President Shahbaz Sharif, and PPP Chairman Bilawal Bhutto were also present along with senior military leadership. The chiefs of Navy and Air Force also attended the ceremony along with several diplomats and ambassadors. In addition, sports personalities including cricketers Shahid Afridi and Zaheer Abbas along with Olympian Shahbaz Senior and squash champion Jahangir Khan were seen among those attending. Among those to host the event were Humayun Saeed, Maya Ali and Hareem Farooq. The ceremony began with a recitation of the Holy Quran, followed by the national anthem. A short film showing the families of martyred soldiers remembering their sons left members of the audience in tears. Singer Sahir Ali Bagga opened the ceremony with a patriotic song, as a video paying tribute to the armed forces played in the background. A moving video showcasing Rahat Fateh Ali Khan's vocal prowess was also played. Other entertainers also took the stage as the evening progressed, and a series of short films and videos were shown to the audience. Earlier today, Defence Day was commemorated with traditional fervour and solemnity across the country, beginning with special prayers for the progress and prosperity of Pakistan. Change of guard ceremonies were held at the mausoleums of Allama Iqbal in Lahore and Quaid-i-Azam in Karachi, and a ceremony at the Pakistan Navy headquarters in Islamabad. Top leadership sends out messages of unity; armed forces commemorate the day with a show of power. Pakistan, on September 6, commemorated the sacrifices made by its armed forces during the 1965 war. Various events were held all over the country to mark the occasion. Personnel from all military and paramilitary forces took part in these events. Prime Minister Imran Khan in his message said Pakistan believes in peaceful coexistence and wants to promote mutual cooperation with other countries, including its neighbours, on the basis of equality. He said the people of Pakistan have the ability to brave all challenges while following Quaid-i-Azam's principles of Unity, Faith, and Discipline. President Mamnoon Hussain and Chief of Army Staff General Qamar Javed Bajwa also sent out messages of unity the occasion. HOW DID PAKISTAN BECOME A NUCLEAR POWER? Today's Gregorian date of September 11 2018 is the start of the Islamic New Year which has reached Muharram 1 1440. We salute the caravan of Islam which has reached this glorious milestone as the immediate future holds the greatest days of Islam ever. We say hold fast and strong to the rope of Islam. This day also marks the 17th anniversary of the satanic false flag terror devised and executed by the enemies of Islam and Muslims. When they launched their murderous new crusade. Bush is caught actually using that term on a tv interview which has been edited now. Everyone should be clear that this GWOT is a Global War of Terror on Islam and Muslims which will boomerang. Every cause will have effect. The significance of this date needs to be clarified for our times. Firstly, so what happened 1440 years ago when England and the British Isles was being evangelised with Pauline Christianity? The AH refers to Annum Hijra ie the year when the Prophet Muhammad(PBUH) migrated from Makkah to Yathrib(Madinah) in 622 AD. He was invited by the tribes of Madinah to establish Islam as the ruling ideology and government. Both Muslims and nonMuslims need to reflect on the significance of this crossroads in early Islamic history. By 632 this is what happened. https://www.youtube.com/watch?v=SUzQLoyAZKc. In the 7th century the pagan Arabian tribes were disunited and feuding and the geopolitical context was dominated by 2 rival superpowers: Byzantium and Sassanid. The world was engulfed by paganism, idolatry and imperialism and Muslims refer to this era as of ignorance and darkness- Jahiliyyah. Fast track 1440 years on and it appears nothing has really changed in our 21st century. Our world with over 8000 million human sapiens is engulfed in a new age of ignorance and darkness of the NWO which is marked by fear, anger and extremes and a regime which demands subservience, servitude and hegemony or else. The only difference between then and now is the nature, scale, scope and impact of the NWO. The NWO and the age of Dajjal(Deceit) we are living in is on the verge of a convulsing crisis which will engulf our world and these forces are prepared to take the world down with them rather than change. The deaf, dumb and blind will regret eternally not paying heed to these words. So where are we just now? Humanity is at an abyss and is facing self destruction as we have a bankrupt ideology and a bankrupt system in which the too big are not only too big to fail but too big to jail. These vultures have escaped Scot free since the great unwind of 2007-8 and are waiting for the next bubble to burst which can happen anytime. We should note that everything is being done to shore up the "imperial dollar" from QE , currency warfare, bailouts, tariffs and austerity. This has only polarised the wealth and gap between the rich and poor and via social media and the internet the mainstream media narrative has been broken and a new consciousness has arisen especially amongst the new generations. The only hope for the world is the dawn of a moral political economy enshrining political economic justice for all which is the basis of the monotheistic universal Abrahamic paradigm. We can now state that a breakthrough has been made by Islamic justice parties in Turkey and now Pakistan which are Muslim majority States with the coming to power and government. In Turkey we have the AKP led by Tayyip Erdogan and in Pakistan the PTI led by Imran Khan. This should bring joy to the hearts of believers and a smile on their faces whilst no doubt anxiety and fear will arise only in the hearts and faces of the enemies of Islam. We now have the great news to announce in 1440/2018 that both Turkey and Pakistan who are blood brothers and are heirs to the legacy of the Ottoman and Mughal Empires. They are being slowly and surely re-aligned in the direction they should have started in 1923 and 1947. These legacy heirs in Europe and Asia are moving their post independence post war national states in the direction of Islam. Turkey's failed US backed military coup d'etat rebounded by bringing the Turkish nation to back the elected AKP government and a purge was activated. In 2018 the elections have entrenched the AKP Government with a new Presidential system. In Pakistan a nation with a turbulent and volatile history the unforeseen and unexpected happened. The Panama paper leaks in July 2016 released evidence on the corruption of the Pakistan PM Nawaz Sharif leading to his disqualification, resignation and eventual imprisonment. This was the final straw breaking the back of corruption and in the recent elections the Pakistan Movement for Justice PTI broke the political duopoly after 22 years since the founding of his political party. Imran Khan's Tehreek i Insaf PTI should be congratulated and saluted for his sweeping victory and we wish him the best. It should be noted this is just the first step in what can only be billed as the long march for justice and NAYA PAKISTAN(New Pakistan) needs to put back the "PAK" back into Pakistan as envisaged by Jinnah. Only by this commitment and change will the Ummah and world take notice insha'allah. The sacrifices of Indian Muslims of the 20th century need to be realised for the masses now. As the winds of change are blowing in the east the time to move the stranded ship of Global Islam has arrived as the tide of history is coming in. The peoples dreams of the Universal Paradigm shift known as TABDEELI in the Indian subcontinent have been awakened and when realised sleeplessness disappears and the spirit awakens and soars upwards. Global Vision 2000 is pleased to announce some salient pre-requisites and the manifesto for this transformation. Although my concerns for an ISLAMIC MANIFESTO for the 2IST CENTURY have been dormant since my youth . I am proposing some suggestions herewith. This means that the time to establish an United States of Islam army upholding the sovereignty, integrity and security of the Khilafa and Khilafate has arrived. As it is clear that one of the factors of decline in Muslim power in the modern era especially compared to Europeans was falling back in terms of war preparedness. Everything from military science and technology, weopons, military-industrial complex, training, military doctrine and sixth generation warfare . This explains the rise of Europe and American empires as well as the use of Empire to support their currencies imperialism that is why we use the term the imperial dollar. The Ummah needs to break the nonMuslim monopoly and leadership in this domain if it is going to attain true and complete independence and subservience to these world powers. The resurrection and establishment of the Khilafah and Khalifate will replace the doctrine of Might is Right and White is Right with an universal doctrine and rule of universal justice. Even in the last world war WW2 which was a European civil war Muslim armies were extensively used to fight the battles of and for nonMuslims. Muslim blood was illegally expended futilely and is not fully acknowledged even today . This can not and must not be repeated in any future world conflict and the Ummah must reorientate and restructure itself to move in this direction. This GWOT attack since 2001 has not only only led to the fragmentation or occupation of Somalia, Sudan, Libya, Yemen, Afghanistan, Iraq and Syria but also the sparking of a Sunni-Shia civil war. So the United States of Islamic army will need to intervene to end these conflicts and tensions. This urgent need has been seen again with the recent genocide committed by Burmese Buddhists. All we saw was the shedding of crocodile tears. Enough is enough innocents butchered whilst the world walks by. Global Vision 2000 wont. . The prosecution of genocidal Nazi Buddhist war criminals and Aung San Suu Kyi is not enough; What about sanctions and regime change. The times demand nothing more or less than raising a real independent global transnational Islamic army of justice defending the defenceless and taking on the oppressors and giving them some of their own medicine. Suffice it to state that the exact nature of this new entity and it's parameters will be dictated by a NON KHWARIJITE interpretation of the doctrine of JIHAD. What is being called for will not be another Western NATO proxy like AL Qaeda or Daesh nor any sectarian entity such as Hizbullah. This is inevitable just as we see the sunset and sunrise. We herald and salute it's dawn. The implications of this is clear and that means the return of the Kingdom of Hejaz in the Arabian peninsula to it's former sovereignty as an independent political entity controlled by Global Islam as Makkah and Madinah need to be free to be effective. Since the establishment of the Kingdom of Saudi Arabia under the auspices of the Anglo American Zionist axis Global Islam has been neutered and it has to be freed and liberated from these constraints. Likewise it is clear that Global Islam can no longer tolerate the constraints and dictated interpretation of Najdi Saudi literal interpretation of Wahabbi Islam which was never mainstream Sunni Islam until patronised and sponsored by the British empire. As the heart beat of the Ummah with the annual Hajj and Umrah it has to be liberated from being a mere ritual increasingly becoming a privilege and playground for the well off and rich. It needs to be transformed into the base and centre for a global ecosystem of mutual solidarity and the defence and integrity of the Ummah. The GWOT has also unleashed a climate of global Islamophobia as the wars both covertly and transparent need to demonise the other the enemy within or out there to create and justify the trillions of dollars or euros spent in this campaign. This needs to be deconstructed by activating DAWAH to neutralise hate campaigns from wherever and whenever. But that is not sufficient and that is why Global Vision 2000 has been focussing on the Universal Islamic values of justice especially universal economic justice where Islam is viewed as a solution for all of humanity. Indeed because Islam is the only remaining civilisational force offering an alternative to the demise of the NWO it is being demonised. Islam needs to be presented NOT as a ritual or doctrine but as a spiritual and moral civilisation offering a holistic sustainable alternative to the crisis ridden and defunct neoliberal financial usurious destructive global capitalistic system and secular fundamentalism which is leading to nihilism. SPOT ON DIAGNOSIS BY IMRAN KHAN WHO WANTS THE PEOPLE, ARMY AND GOVERNMENT TO CHANGE AND ACT IN UNISON AND UNITY TO OVERCOMING THE LEGACY OF THE BRITISH RAJ , ELITE COLONIAL MINDSET AND PAX AMERICANA TO ACHIEVE THE PAKISTANI POLITICAL AND ECONOMIC REVIVAL. THE FINANCIAL, BANKING USURIOUS DEBT AND MILITARY TRAP SET BY THE ENEMIES OF THE NATION NEEDS TO BE BROKEN WITH AN EMERGENCY NATIONAL PLAN OF ACTION . WARNING ON THE COUNTER REVOLUTION MOVES BY ENEMIES OF ISLAM AND MUSLIMS AGAINST NEW PAKISTAN TABDEELI GOVERNMENT. 0VER 384 PEOPLE HAVE BEEN ARRESTED BY THE AUTHORITIES SEEKING TO ASSASSINATE PM IMRAN KHAN AND CIA MEDIA BLACK PROPAGANDA WAR LAUNCHED AND FALSE FLAG TERROR PLANNED TO BLAME PAKISTAN AND INSTIGATE WAR. ARE WE ABOUT TO SEE THE GWOT LAUNCHED SINCE 9/11 ABOUT TO BOOMERANG? There are many misconceptions in the Ummah regarding Muharram. Many of us mix the Shia and Sunni aqeedah . Here I am including some lectures and Videos that can help you educate about Muharram and Ashura. Hope you find them Useful. But before that I would like to clarify some aqeedah of Shia and Sunni on the event of Ashura. For the majority of Shi’a Muslims, Ashura marks the climax of the Remembrance of Muharram, and commemorates the death of Husayn ibn Ali RA , the grandson of Muhammad SAW at the Battle of Karbala on 10 Muharram in the year 61 AH . Shia Imams strongly insist that the day of Ashura should not be celebrated as a day of joy and festivity. The day of Ashura, according to Eighth Shia Imam Ali al-Rida, must be observed as a day of rest, sorrow, and total disregard of worldly matters. Some of the events associated with Ashura are held in special congregation halls known as “Imambargah” and Hussainia . Shi’as make pilgrimages on Ashura, as they do forty days later on Arba’een, to the Mashhad al-Husayn, the shrine in Karbala, Iraq, that is traditionally held to be Husayn’s tomb. On this day Shi’a are in remembrance, and mourning attire is worn. They refrain from listening to or playing music. They have a certain traditional flagellation rituals such as Talwar zani (talwar ka matam or sometimes tatbir) use a sword. Other rituals such as zanjeer zani or zanjeer matam involve the use of a zanjeer (a chain with blades). Based on the Hadith of Prophet Muhammad (saws), Sunni Muslims celebrate Ashura as the day when Prophet Moses (Moosa) fasted on that day because Allah saved the Israelites from their enemy in Egypt. One of the many Ahadith (sayings of Prophet Muhammad) that attests to that is in Bukhari that states: Narrated by al-Bukhari (1865) from Ibn ‘Abbaas, who said: The Prophet (saws) came to Madinah and saw the Jews fasting on the day of Ashoora. He said, “What is this?” They said, “This is a good day, this is the day when Allah saved the Children of Israel from their enemy and Moosa fasted on this day.” He (the Prophet Muhammad) said, “We are closer to Moosa (Prophet Moses) than you.” So Prophet Muhammad fasted on this day in Muharram and told the people to fast. According to a version narrated by Muslim, This is a great day when Allah saved Moosa (Moses) and his people and drowned Pharaoh and his people.” Sunni Muslims celebrate Ashura by fasting on that day. Usually, Sunni Muslims are recommended to fast on the 9th and 10th of Muharram. Al-Shafa’i and his companions, Ahmad, Ishaaq and others said: It is mustahabb [recommended] to fast both the ninth and the tenth, because the Prophet (peace and blessings of Allah be upon him) fasted the tenth and intended to fast the ninth. Based on this, there are different ways of fasting ‘Ashoora’, the least of which is to fast the tenth only, but it is better to fast the ninth as well. The more one fasts in Muharram, the better. This is the month of al-Muharram, the first in the Islamic lunar calendar. It is one of the three sacred months that fall together and follows immediately after Dhu al-Hijjah, the last month of the lunar year. In Dhu al-Hijjah, Muslims sacrifice a lamb that was substituted for Isma‘il when Allah (swt) commanded Ibrahim (a) to make the sacrifice. In al-Muharram, Imam Husayn (a) offered his life and that of his family members and close companions. The life that was spared in Dhu al-Hijjah was thus offered in al-Muharram to save Islam. Imam Husayn’s principled stand, demanding the supreme sacrifice of his life, slammed the door in the face of usurpers and tyrants to seek legitimacy for their illegitimate rule. His lonely struggle is repeated in many parts of the world, regrettably with the same tragic consequences. The Husayns of the world again stand alone despite Muslims commemorating ‘Ashura’ every year. In al-Muharram, the virtues of Imam Husayn (a) are extolled from every minbar but the world is still full of Yazids. Why? Regrettably, large numbers of Muslims have lost their way in peripheral issues and become engrossed in rituals. The illegitimate rulers and their court ‘ulama’ deliberately foster this attitude. The reason is to divert attention from the revolutionary spirit of Islam and the purpose of Imam Husayn’s struggle for truth and justice. Today the Rohingya Muslims join a long list of other oppressed people from Kashmir to Palestine, and Iraq and Syria to Yemen facing their own Karbala’. The greater tragedy is that the Yazids too have multiplied. While millions of Muslims extol the great virtues and sacrifice of Imam Husayn (a), joined even by some Muslim rulers, the same rulers simultaneously indulge in Yazidi practices. Their torture chambers echo with the cries of today’s Husayns. While the great Imam adopted a principled stand against injustice, these rulers indulge in oppression, tyranny, and gross injustices. If Imam Husayn (a) and his family stood alone on the blistering sand of Karbala’ 1,400 years ago, today the Rohingya Muslims stand alone in the squalid refugee camps of Bangladesh. The children of Ghazzah are besieged from all sides and are being starved to death, as were Imam Husayn, his children, and grandchildren. The people of Kashmir face the guns and bullets of a brutal Indian army as Imam Husayn faced the heavily armed Yazidi army with its swords and spears drawn. So what has really changed in 1,400 years? The struggle between haqq and batil is as old as human history. When Iblis refused to obey Allah’s (swt) command to prostrate before Adam (a), the struggle between obedience and defiance came out into the open. Muslims would do well to remember that Iblis was not a mushrik; it was his arrogance and sense of self-proclaimed superiority that led him to disobey Allah (swt). Can Muslims not make the connection between Iblis’ conduct and that of the Muslim rulers today? (Islam’s revival occurs after every tragedy like Karbala). Let us also be clear about the true nature of Imam Husayn’s sacrifice. He did not struggle for worldly gain or power; he was aware that if he gave in to the demands of Yazid, it would destroy Islam. For him, Islamic principles were more important than his personal well-being. He died in a strange land after witnessing the murder of almost all members of his family and close companions; he preferred to die rather than compromise with Zulm and oppression. When asked to give allegiance to Yazid and save his life, he exclaimed, “A man like me cannot give allegiance to a man like Yazid!” Such clarity of vision, purpose, and commitment are lacking among Muslims today; this is what has led to the Muslims’ present sorry predicament. Imam Husayn (a) had correctly diagnosed the problem confronting the Ummah in his time. It was a question of illegitimacy and the usurpation of power and authority by unscrupulous people totally unfit to rule. He raised his voice against it; regrettably, there were not enough Muslims willing to offer their lives for Islam’s principles. Even many of those who initially joined the Imam eventually betrayed him. Yet this does not detract from his principled stand and his willingness to offer his own life in order not to lend weight to the corruption of Islamic principles. The sacred month of Muharram follows the sacred month of Dhul Hijjah. Salina Khan argues that the true significance of Ashura and the martyrdom of Imam Hussain must be addressed honestly to create awareness among Muslims about issues of legitimacy, justice, dignity and freedom in Islam. Salina Khan writes an open letter to the silent majority. It will break my heart if I have to sit through another typical ‘Ashura gathering. That is why I have decided to write this letter appealing for full disclosure and impartiality from scholars lecturing at most masjids around the world. At many of these commemorations, much time is spent relating how Allah (swt) blessed a string of noble prophets on ‘Ashura, the 10th day of the sacred month of al-Muharram, as they spread the divine message on earth. But little to no time is given to discuss the ‘Ashura event that safeguarded this same message from corruption after the era of the prophets came to an end. So, respected scholars, when you remind us on the 10th of al-Muharram that on this day, that Adam (a) was forgiven after his exile, remember to talk about Imam Husayn as he is chief of the youth of those eternal gardens of Paradise. …that Jacob was reunited with his son Joseph (a), remember to talk about Imam Husayn as he lost on this day his young sons, including a thirsty baby pierced by an arrow in the neck while being cradled in his arms. …that Abraham (a) was protected from the fire, remember to talk about Imam Husayn as he was left the last man standing “under the blazing sun, on the parched land and against the stifling heat of Arabia,” in the words of historian Washington Irving. Now, don’t stop short. Continue the narrative by reminding us what our own Prophet Muhammad (pbuh) did on this fateful day. With dust on his head and dust in his beard, he was the first to propagate the plight of Husayn, the grandchild he once cuddled in his lap and rode on his back. “I have just been at the slaying of al-Husayn,” he told his wife Umm Salamah in a dream of hers, according to her tearful narration (recorded by al-Tirmidhi). Respected scholars, I ask you to disseminate the story of Imam Husayn far and wide — not for the sake of historical truth or inclusiveness — but because it is the Sunnah (social convention) of the Prophet (pbuh) and exactly what the world needs right now! People in all corners of the globe are finally wising up to the injustices being committed against them. It is from Imam Husayn they can learn how a small cadre of people dedicated to truth, peace and justice can undertake a successful struggle against tyrannical regimes with wide-reaching control. “Let humanity awaken and every tribe will claim Imam Husayn for their own,” predicts poet Josh Malihabadi. YOM KIPPUR AND ASHOURA : ARE MUSLIMS OBSERVING A JEWISH HOLIDAY? Both the Jewish and Islamic calendars are lunar while the Gregorian calendar on which they are being cast is solar. The lunar calendar is 11 days shorter than the solar and for that reason, though stable on their own respective calendars, Jewish and Islamic holidays appear to "roam" aimlessly on the Christian calendar. None of this is "the fault" of either the Jewish or the Islamic calendar. Given the way in which the Christian calendar has been imperially universalised, the other two may look erratic and confusing, but Jewish and Islamic high holy days are perfectly logical, routine, and regular. Both Jewish and Muslim observers have noticed this proximity between Yom Kippur and Ashoura. On the occasion of the two holidays coinciding in 2016, Rabbi Allen S Maller noted how "both holy days occur on the 10th day of the month, Muharram for Muslims and Tishri for Jews." By way of explanation, he adds: "In ancient times the two branches of Abraham's house followed the same lunar-solar system of intercalating an additional month 7 times in a cycle of 19 years. Thus, the 7th Jewish month of Tishri coincided with Muharram; and the 'Ashura (10th) of Muharram synchronized with the 10th of Tishri, the Jewish Day of Atonement - a day of fast." On the occasion of a similar concurrence in 2015, Haroon Moghul , a Muslim American writer and a fellow at the Institute for Social Policy and Understanding, wrote in a piece for CNN: "If you're wondering why Muslims would celebrate a Jewish holiday, that's because neither [Prophet] Mohammed nor the Early Muslims saw themselves as part of a new faith." Both Maller and Moghul cite an authentic prophetic hadith, according to which Prophet Muhammad once encountered Jews in Medina fasting on the 10th of Muharram/Tishrei and joined them in their fast. Thus the origin of this overlap in tradition is traced back to the time of the Prophet himself. The similarities, correspondences and affinities of such aspects of Islam and Judaism are only strange or bizarre to those who have fallen into the trap of falsely projecting the Zionist colonial adventurism in Palestine backwards onto history and positing an entrenched hostility between Jews and Muslims. Like Christianity, Islam is deeply influenced by Judaism and has an even stronger proximity to its theological monotheism. This is not a matter of opinion or ideological position. It is a matter of historical fact. The infamous statement of former US president Barack Obama that "The Middle East is going through a transformation that will play out for a generation, rooted in conflicts that date back millennia," is typical of the ahistorical gibberish that manufactures hostility between Islam and Judaism, and perforce between Jews and Muslims. By making such declarations, Obama projects his own criminal role in prolonging the Palestinian suffering under Zionist occupation to some distant past that never was. Much of the confusion and conflation of Judaism and Zionism, and particularly the false and pernicious extension of the charge of anti-Semitism against Muslims, have the same roots as this forced approximation of both Jewish and Islamic calendars to the Gregorian calendar - where Jews and Muslims are forced to see each other in Christian terms. Zionism is the condition of Jewish alienation from Judaism, precisely in the way militant Islamism is the condition of self-alienation for Muslims. Contrary to "the Judeo-Christian" concoction (contested and contradicted by a long history of Christian anti-Semitism), the idea of Judeo-Islamic tradition is not based on any political or ideological project but evident in the most robust period of Jewish and Islamic philosophies that is unrivalled in any other tradition. Consider the fact that saying these Jewish and Islamic holidays are on such and such days in September is entirely meaningless to both Jews and Muslims and the inner rhythm of their own respective calendars. We are forced to do so because we are writing in English (as opposed to Hebrew, Arabic, Persian, Turkish, Urdu, etc.) and using what is called "Common Era," or "Civic Calendar". Both of these expressions are actually nervous and futile attempts to disguise the fact that we are all forced to use an imperial Christian calendar, which is ipso facto a distortion of the time and narrative of both Jews and Muslims and which approximates them to a dominant Christian temporal order. As a European colonial project, Zionism was formed in a decidedly Christian context and its endemic anti-Semitism - most violently evident in the course of the Crusades - of endless pogroms and, ultimately, the Holocaust. But before and beyond the Zionist abuse of Judaism (similar to the Islamist abuse of Islam in Iran and Saudi Arabia, or colonial abuse of Christianity in the US, the fundamentalist abuse of Hinduism in India, or the nationalist abuse of Buddhism in Myanmar), there is an enduring and historically grounded proximity to the Judeo-Islamic heritage which started even before the Golden Era of Andalusia. From Saadia Gaon (882-942) to Yehuda Halevi (1075-1141) to Maimonides (1135-1204), the leading luminaries of Jewish philosophy were in enduring conversation with their Muslim counterpart - Avicenna (980-1037), Abu Hamid al-Ghazali (1058-1111) and Averroes (1126-1198). This Judeo-Islamic philosophical tradition was real and not created out of any political convenience or necessity. Today, militant Zionism, puritanical Islamism and evangelical imperialism are collectively invested in concealing these historical facts and either denying or else catapulting the profound heritage of Judeo-Islamic philosophy back into "ancient times". Racist, Islamophobic, xenophobic anti-Semites like Steve Bannon (a strong advocate of Israel) now use the term "Judeo-Christian tradition" as a subterfuge to fabricate a common religious foregrounding for anti-Muslim bigotry. There is an entire bloody history of Jewish suffering defying that hyphenated delusion of "Judeo-Christian" heritage. How could a racist, Christian-Zionist anti-Semite lay a claim on any "Judeo-Christian" heritage - except as a ridiculously transparent Islamophobic trope? The fact of the Judeo-Islamic tradition, however, is far more potent historical evidence than semi-literate propaganda officers like Bannon and his ilk can even fathom, let alone contest. Three complementary ideological fanaticisms are chiefly responsible for the sustained bifurcation manufactured today between Islam and Judaism - all of them handmade by European colonialism, all of them invested in denying and dismissing the legacies of the Judeo-Islamic tradition. Militant Islamism, fanatical Zionism and Christian imperialism are the triangulated foregrounding of fear and fanaticism that has wreaked havoc in our world and systematically and consistently distorted the clarity of our historical visions. Wahhabism in Saudi Arabia, militant Shi'ism in Iran, and Zionism in Israel are today the identical ideological byproducts of European colonialism. In opposition to European colonialism, militant Islamism (both the Sunni and Shia versions of it), stripped Islamic intellectual history of its factual pluralistic and cosmopolitan character, reducing it to a singular site of resistance to European colonialism. In the same vein, Zionism, extending the racist logic of European colonialism into the heart of the Arab world, stripped Judaism of its equally worldly moral imagination. Fanatical Islamism, settler colonial Zionism and imperial evangelicalism are chiefly responsible for this manufactured rift between Judaism and Islam against the historical grain of their proximities. And precisely for that reason, any legitimate criticism of Zionism as a racist colonial project that spills over into a racist attack on Judaism and Jews is falling fast into the Zionist trap and by definition is anti-Semitic. Of course, what has historically exacerbated the mutual impacts of Islamism and Zionism is the course of Christian imperialism, now best represented in the racist malignancies of the likes of Steve Bannon. His brand of evangelical imperialism now actively presides over and exacerbates both militant Islamism and fanatical Zionism. Steve Bannon, Abu Bakr al-Baghdadi and Naftali Bennett are all cut from the same cloth. To state and repeat the obvious: not all Zionists are Jews and not all Jews are Zionists. Christian and now even Muslim and Hindu Zionists are among the wealthiest and most powerful, sustaining the calamitous course of the colonisation of Palestine. That is the end of the false and deliberate Zionist conflation of their violent state ideology with Judaism - precisely on the model of the abuse of Islam and Muslims by Islamist ideologies now ruling in Iran and Saudi Arabia. In their mutual hostilities against each other, they are in fact steadfastly united with each other in robbing Judaism, Christianity and Islam of their shared legacies, blinding the world to reason and sanity. The idea of a much closer proximity between Islam and Judaism than now deliberately clouded by the Zionist colonial project does not mean historically there has not been a relation of power between the two world religions. From its very inception, Islam has been definitive to multiple and successive world empires - in which (from the Umayyads and the Abbasids to the Safavids and the Ottomans) Zoroastrian, Jewish, and Christian communities have lived. There could not have possibly been any equality between the ruling elite of the powerful Muslim empires and these small minorities in their domains. That in these dynastic and imperial Muslim contexts there has been a Judeo-Islamic philosophical tradition unrivalled anywhere else in the world is a testimony to the presence of potent intellectual thrusts among Muslim and Jewish philosophers responding to the mighty heritage of Greek philosophical tradition they shared. The fates of both Judaism and Islam have been pitted against each other in the context of European colonial conquests in Arab lands, giving almost simultaneous birth to militant Zionism and triumphalist Islamism - one as a colonial and the other as an anti-colonial project of violent state-formation. Militant Islamism and bellicose Zionism are coterminous with the Christian imperialism that frames them both. All these three triumphalist ideologies are morally bankrupt projects. The task at hand is how to save Islam, Judaism, and Christianity - as three world religions and concurrent frames of our moral imagination - from the claws of so many decades of epistemic abuse. The concurrence of Yom Kippur and Ashoura this September is a gentle reminder of a much different history than the one mandated in Palestine and beyond by the malignant disease of European colonialism. WHILE SOME MUSLIM STATES ARE STARTING TO SAY THE RIGHT THINGS AND ASSERT THEMSELVES ON THE WORLD STAGE AT LAST. THE REAL CHANGE WILL COME FROM THE PERIPHERY AND NOT FROM WHAT ARE POLITICALLY CORRECT STANCES. THE TIME TO OPENLY ARTICULATE AND DEFEND GLOBAL MUSLIM INTERESTS HAS ARRIVED. TRUMP NEEDS TO REALISE THAT HIS AMERICA FIRST DOCTRINE DOES NOT GIVE HIM AN UNILATERAL RIGHT TO PAX AMERICANA. PAX ISLAMICA - A WORLD ISLAMIC CIVILISATION CAN NO LONGER BE MARGINALISED AND DEMONISED ANY LONGER AND ACT IN A SUBSERVIENT WAY. IN COLONIAL TIMES THERE WAS A PANISLAMIC ANTI-IMPERIALIST MOVEMENT WHICH WAS SNUFFED OUT IN THE 20TH CENTURY. NOW IN THE 21ST CENTURY WHEN THE MUSLIM HEARTLANDS ARE ONE OF THE MAJOR STAGES FOR CONFLICT AND SUBJECT TO A PHONEY GLOBAL WAR OF TERROR BY THE ENEMIES OF ISLAM AND MUSLIMS IT IS IMPERATIVE THAT THE DOCTRINE OF GLOBAL JIHAD BE RESURRECTED. WE SHOULD REALISE THAT IN THE RISE OF EARLY ISLAM OVER 1400 YEARS IF AN INDIVIDUAL OR A NATION WHO WERE OPPRESSED AND CALLED FOR ASSISTANCE FROM OUTSIDE IT WOULD BE IMPERATIVE FOR THE MUSLIM LEADER AT THE TIME TO RESPOND WITH A CALL FOR A JIHAD TO LIBERATE THE VICTIMS FROM THE OPPRESSOR NO MATTER WHAT THE COST. THE PROPHET OF ISLAM IN HIS PROPHETIC SAYINGS STATED THAT ONE OF THE REASONS OF THE MUSLIM WORLDS CONDITION WILL BE AS IT IS NOW IN THE 21ST CENTURY DESPITE BEING 1:4 OF HUMANITY IS THE LOVE OF THE DUNYA- WORLD AND FEAR OF DEATH. THE CALL OF LIBERATION FROM CAPTURED MUSLIM MEN AND WOMEN EXPLAINS THE INITIAL ARRIVAL OF ISLAM IN INDIA AGAINST HINDU RAJA DAHIR IN SINDH IN 711 AND IN OPPRESSIVE BYZANTIUM EGYPT. THIS IS WHY ISLAM CAN NOT RISE ON THE GLOBAL STAGE UNLESS AND UNTIL THE RULES OF THE GAME ARE DISCARDED AND MUSLIMS ESTABLISH ISLAMIC JUSTICE TO REPLACE THE RULE OF MIGHT IS RIGHT. IF THERE IS GOING TO BE A GLOBAL CONFLICT EVERYONE NEEDS TO ESTABLISH THEY ARE FIGHTING FOR THOSE UPHOLDING TRUTH AND JUSTICE AGAINST FALSEHOOD. BUT THE PRE-CONDITION OF THIS IS TO ELIMINATE FEAR OF FEAR AND TRANSCEND LIMITATIONS WITH DIVINE SUPPORT. GLOBAL VISION 2000 WILL FOCUS ON THE EVOLUTION AND RESURRECTION OF THE DIVINE PERSONALITY HEREAFTER. The UN Security Council currently serves the interests of its five permanent members holding veto rights, Turkish President Recep Tayyip Erdogan said on Tuesday. The five members of the Council, the US, Russia, China, France and Britain are, "standing idle to the oppression in other parts of the world," Erdogan said in his address to the 73rd session of UN General Assembly. "The world is bigger than five." Erdogan said the UN has carried out work and achieved considerable successes over its 73-year history. "However, it is also a fact that over time the United Nations moved away from meeting the expectations of humanity for peace and welfare," he added. Erdogan said past "massacres" in Bosnia, Rwanda and Somalia, recent ones in Myanmar and ongoing ones in Palestine, have all taken place before the eyes of the Security Council. "Those who do not raise their voices against the oppression of the Palestinians, their efforts even to reduce assistance for them, are only increasing the courage of the oppressors," he added, referring to the recent US decision to cut aid to the UN agency for Palestinian refugees. Turkey will continue to stand with the "oppressed" Palestinians and will protect the historical and legal status of Jerusalem, Erdogan said. Limiting the reform of the UN to the budget only will neither contribute to the solution of real problems nor make anybody happy, he said. The president added there is a need for increasing UN efficiency "which I find very important for the future of the world, on its fundamental areas of duty, which are security, development and social equality." "When the assets of the wealthiest 62 people in the world amount to the assets of half of the world’s population of 3.6 billion people, this means there is a problem," Erdogan said. He called for establishing a new global system at the UN that will be the voice of implementer of humankind’s expectation for justice. 'More abundant, flexible support'. Erdogan said Turkey continues its efforts towards a fairer world while implementing a global humanitarian diplomacy. He recalled that Turkey hosts 4 million refugees, 3.5 million of which are Syrian, and provides them with services that are "incomparable" elsewhere in the world. The total amount Turkey has spent for Syrian refugees alone is at $32 billion. "However, so far, the external support we have received is $600 million from international organisations and €1.7 billion from the EU until now," Erdogan said. Erdogan said Turkey has contributed substantially to the UN in regards to the Gulf crisis, people in Arakan – northern Rakhine State, Myanmar – racism, xenophobia and Islamophobia and also Syria. He said Turkey tries to make Syria a peaceful country again by means of support for Geneva and Astana talks that aim to find a peaceful solution to the Syrian crisis. "By clearing the Jarablus and Al Rai regions from Daesh, and Afrin region from PKK/PYD/YPG terrorist organisations, we have turned an area of 4,000 kilometres into a safe and peaceful place for millions of Syrians," Erdogan said. He added Turkey has prevented "bloody assaults" by Bashar al Assad's regime against the de-escalation area in Idlib, having signed the Sochi deal with Russia. Hinting at US support for PYD/YPG, the Syrian affiliate of the PKK terror organisation, Erdogan said, "Those who equip terrorists with tens of thousands of trucks and thousands of cargo planes' load of arms for the sake of their tactical interests will most definitely feel sorrow in the future." Erdogan said all terrorist organisations do not obtain their power from their armed actions, rather some hide behind "glossy concepts" such as education, welfare and dialogue, and continue operations as NGOs or businesses. "Through the support of our people to our resolute struggle over the last five years, we have eliminated the majority of FETO [terrorist organisation] in our country. " FETO and its US-based leader Fetullah Gulen were behind the defeated coup in Turkey on July 15, 2016, which left 251 people dead and nearly 2,200 wounded. He said countries have heeded Turkey's warnings and learned from its lessons and are deciphering the organisation and expelling it from their lands. However, some states, including the US and European countries, "have not understood the danger." "For instance, the amount of funds that the FETO terrorist organisation receives in 27 US states from the government budget solely by charter schools is $763 million," he added. Erdogan said trade wars have harmed humanity in every period. "None of us can remain silent to the arbitrary cancellation of commercial agreements, the spreading prevalence of protectionism and the use of economic sanctions as weapons. "The negative effects of these twisted developments will eventually affect all countries," he added. The president called on countries to work together to prevent damage to the world trade regime as a result of such unilateral decisions. Erdogan also called for an institution within the UN for the youth. "As Turkey, we propose establishing a UN Youth Organization as soon as possible and suggest Istanbul, one of the symbolic cities of world history, as its headquarters," he added. The president added there is a need for increasing UN efficiency "which I find very important for the future of the world, on its fundamental areas of duty, which are security, development and social equality." "When the assets of the wealthiest 62 people in the world amount to the assets of half of the world’s population of 3.6 billion people, this means there is a problem," Erdogan said. He called for establishing a new global system at the UN that will be the voice of implementer of humankind’s expectation for justice. Erdogan said Turkey continues its efforts towards a fairer world while implementing a global humanitarian diplomacy. He recalled that Turkey hosts 4 million refugees, 3.5 million of which are Syrian, and provides them with services that are "incomparable" elsewhere in the world. The total amount Turkey has spent for Syrian refugees alone is at $32 billion. "However, so far, the external support we have received is $600 million from international organisations and €1.7 billion from the EU until now," Erdogan said. IT IS CLEAR THAT FALSE FLAG TERROR EVENTS ARE BEING ORCHESTRATED AND COORDINATED CENTRALLY BY THE ENEMIES OF ISLAM. THE GLOBAL WAR OF TERROR ON ISLAM AND MUSLIMS NEEDS TO CREATE ISLAMOPHOBIA AS IT IS THE INSTRUMENT TO JUSTIFY AND ENGAGE IN AGGRESSION, VIOLENCE AND WAR AGAINST MUSLIMS AND ISLAM. NO WONDER THERE IS NOW A TREND OF GLOBAL ISLAMOPHOBIA BECOMING NORMALISED AS IT INVOLVES BEARING FALSE WITNESS TO DEMONISE AND DEFAME ISLAM AND MUSLIMS IN THE EYES OF THE WORLD. HAQEEQAT TV- HAQEEQAT IS AN URDU WORD FOR REALITY. HAQEEQAT TV STATES THAT IT IS PRODUCING A FULL HOUR VIDEO BROADCAST ON THE SAME TOPIC WHICH WE LOOK FORWARD TO REVIEW. INDIAN HINDUISM BASED ISLAMOPHOBIA IS DEEPROOTED AND THE CURRENT MODI BJP PARTY BASED ON HINDUTVA IDEOLOGY NEEDS TO BE EXPOSED AS IT IS NO LESS THAN A DANGER TO WORLD PEACE. IT IS NOW OPENLY ALLIED TO THE ZIONIST ISRAELI ENTITY AND INVOLVED IN MULTIBILLION MILITARY INDUSTRIAL INTELLIGENCE DEALS. ALL TRUTH SEEKERS NEED TO DRAW THE POWER OF TRUTH AND JUSTICE TO EXPOSE WHAT CAN ONLY BE TERMED INDIAN HINDU FASCISM ON THE MARCH. THIS IS A STARTER. HAQEEQAT TV is bringing a solid documentary of false flag Mumbai Attacks 26/11 done by IB India and put the blame on Pakistanis. According to S.M Mushrif former I.G Police Maharashtra; Ajmal Kassab was kidnapped by Indian Intelligence Agency RAW in 2006 from Nepal. IB India has used him in Mumbai Attacks. He even did not kill a single person but was presented by Indian agency. This was an inside Job. The crisis of global human civilisation has been encapsulated and documented by various global institutions, writers, thinkers to date from different religious and ideological perspectives. Given the convergence of a multiplicity of crises especially environmental, ecological, political and economic and the growing momentum towards a WW3 it was deemed essential to look over the horizon by stepping into the past and understand, clarify, contrast what the different faith and secular traditions had to say on the subject of eschatology. The status of this topic is fragmented in officialdom and subject to different interpretations and sharp divisions at an intrafaith level. Yet the subject matter has always been there and holds a powerful hold on the imagination of billions globally. Also with the seemingly demise of secular ideologies such as capitalist and communist orientation there is a rise in end time apocalyptic movements from different traditions seeking solutions outwith conventional party politics and manifestoes. There is also evidence that the powers that be have been tapping into this and manipulating these tendencies for their own ends. In order to deal with this theme comprehensively there is a need for an interdisciplinary approach as it covers theology, religious history, current affairs, politics and economics. It deals with end time, global hope and salvation, heroes and villains, conflict and peace as well as understanding the Deep State, the Occult , NWO and the Age of propaganda and deceit. Eschatology is defined as part of theology concerned with the final events of history, or the ultimate destiny of humanity. This concept is commonly referred to as the "end of the world" or "end time". The word arises from the Greek words meaning "last" and "the study of", first used in English around 1550. The Oxford English Dictionary defines eschatology as "The department of theological science concerned with ‘the four last things: death, judgment, heaven and hell’. In the context of mysticism, the phrase refers metaphorically to the end of ordinary reality and reunion with the Divine. In many religions it is taught as an existing future event prophesied in sacred texts or folklore. More broadly, eschatology may encompass related concepts such as the Messiah or Messianic Age, the end time, and the end of days. History is often divided into "ages" (aeons), which are time periods each with certain commonalities. One age comes to an end and a new age or world to come, where different realities are present, begins. When such transitions from one age to another are the subject of eschatological discussion, the phrase, "end of the world", is replaced by "end of the age", "end of an era", or "end of life as we know it". Much apocalyptic fiction does not deal with the "end of time" but rather with the end of a certain period of time, the end of life as it is now, and the beginning of a new period of time. It is usually a crisis that brings an end to current reality and ushers in a new way of living, thinking, or being. This crisis may take the form of the intervention of a deity in history, a war, a change in the environment, or the reaching of a new level of consciousness. Most modern eschatology and apocalypticism, both religious and secular, involve the violent disruption or destruction of the world; whereas Abrahamic eschatologies view the end times as the consummation or perfection of God's creation of the world. In which the world began with God and is constantly headed toward God’s final goal for creation, which is the world to come. Eschatologies vary as to their degree of optimism or pessimism about the future. In some eschatologies, conditions are better for some and worse for others. What is the nature, sources and beliefs of eschatology in the eschaton of Judaism, Christianity and Islam and other traditions? Are there any commonalities and what are the differences? What are the implications of eschatology for Human civilisation and World Justice and Peace? How is this impacting these communities of faith and secularism in terms of preparedness? In terms of agreement, consensus and strategic planning. Is eschatology being manipulated in the Age of Deceit by the powers that be and how to redress this ? that might weaken peaceful human co-existence. Presentations will be given and all speakers are expected to participate in the event in order to create a mosaic of understanding. There will be no strict rules of procedure governing the conference in order that a relaxed, atmosphere conducive to free and frank discussion is facilitated. In no sense is it a policymaking body. There is no voting and no attempt to reach or adopt resolutions. All individuals are invited in a personal capacity. An invitation only event for individuals who have a track record of research or advocacy on the principle of primus inter pares. The initial stage of this process will be on an interfaith and secularist traditions only event. 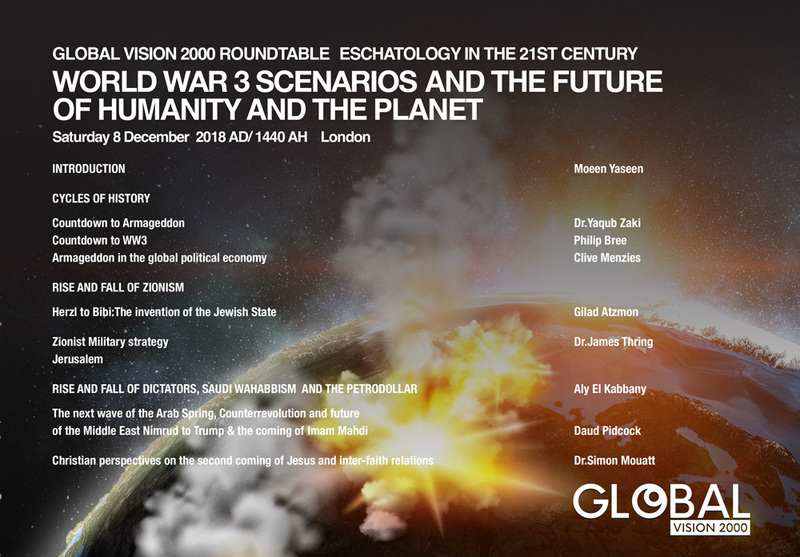 Global Vision 2000 the International Islamic thinktank held an one day thinktank event in London on World War 3 scenarios and the future of humanity and the planet. This was a launching of it’s ground breaking work on eschatology in the 21st century within the framework of interfaith and comparative perspectives. Muslim, Christian, Jewish and secular experts coming from multidisciplinary perspectives especially global political economy, geopolitics, history and theology presented their research. There were 3 sessions on the themes of Cycles of history, Rise and Fall of Zionism and a special focus on the interconnectivity and synthesis of Christian and Islamic eschatology. The main speakers were Dr. Yaqub Zaki, Philip Bree, Clive Menzies, David Triggs, Gilad Atzmon, Dr.James Thring, Rachel Searle, Daud Pidcock and Dr.Simon Mouatt. Dr.Yaqub Zaki argued that global Islamic civilization was being framed as a perpetual irreconcilable enemy of the West and pointed to Huntingdon as the harbinger of Armageddon. He warned the arrogant triumphant West that Islam is a resilient, self renewing civilization and as a messianic faith it is invincible as it’s adherents see themselves as servants of history. Philip Bree claimed in Countdown to WW3 that the USA and its allies want a war with the rival Chinese-Russian-Iranian axis inclusive of a nuclear war by 2020. Clive Menzies stated the world is ruled by corporate fascism which foments fears and conflicts and was promoting civil wars. David Triggs highlighted trade wars creating chaos, stagnation and depression as in the interwar period. Gilad Atzmon said that ww3 has already broken out but is manifested by the rise of nationalisms. Dr.James Thring exposed the Zionist military strategy inclusive of its control of cyberwarfare. He warned of an Israeli false flag terror against Iran triggering ww3 by involving all the superpowers leading to their destruction. Rachel Searle advocated Jerusalem becoming an unified internationalized city freed from Zionist Israeli occupation. Daud Pidcock stated all the chaos in the Middle East stems from WW1 to this day. The Muslims need to prepare for the coming of the Imam Mahdi army of liberation and universal justice from Khurasan. According to hidden suppressed hadith sources he predicted that WW3 would break out in 2022. Dr.Simon Mouatt reviewed Christian Millenialism views and believed Christian Zionism was attempting to hijack Christianity and underwriting Zionism. He suggested other interpretations which opens the door for a synthesis of Islamic and Christian eschatologies as there is a common belief in the second coming of Jesus. In Islamic eschatology there is an Unity of will, vision and action between Imam Mahdi and Jesus. Moeen Yaseen the Director of Global Vision 2000 stated that it is clear that we can not view contemporary global trends and developments except from an eschatological perspective. The time has come to engage with leaders in the Muslim world in 2019 as we are in a state of emergency and have to prepare to meet the trials and tribulations confronting us. WHY DID THE MEDIA OMIT REFERENCE TO WW3 BREAKING OUT IN 2020 OR 2022 ACCORDING TO 2 EXPERTS? Dr.Zaki argued that global Islamic civilization was being framed as a perpetual irreconcilable enemy of the West and pointed to Huntingdon as the harbinger of the Armageddon. He warned the arrogant triumphant West that Islam is a resilient, self renewing civilization and as a messianic faith it is invincible as it’s adherents see themselves as servants of history. Philip Bree claimed in Countdown to WW3 that the USA and its allies want a war with the rival Chinese-Russian-Iranian axis. Clive Menzies stated the world is ruled by corporate fascism which foments fears and conflicts and was promoting civil wars. David Triggs highlighted trade wars creating chaos, stagnation and depression as in the interwar period. Gilad Atzmon said that ww3 has already broken out but is manifested by the rise of nationalisms. Dr.James Thring exposed the Zionist military strategy inclusive of its control of cyberwarfare. He warned of an Israeli false flag terror against Iran triggering ww3 by involving all the superpowers leading to their destruction. Rachel Searle advocated Jerusalem becoming an unified internationalized city freed from Zionist Israeli occupation. Daud Pidcock stated all the chaos in the Middle East stems from WW1 to this day. The Muslims need to prepare for the coming of the Imam Mahdi of liberation and universal justice. Dr.Simon Mouatt reviewed Christian Millenialism views and believed Christian Zionism was attempting to hijack Christianity and underwriting Zionism. He suggested other interpretations which opens the door for a synthesis of Islamic and Christian eschatologies as there is a common belief in the second coming of Jesus. In Islamic eschatology there is an Unity of will, vision and action between Imam Mahdi and Jesus. Moeen Yaseen the Director of Global Vision 2000 stated that it is clear that we can not view contemporary global trends and developments except from an eschatological perspective. The time has come to engage with leaders in the Muslim world as we are in a state of emergency and have to prepare to meet the trials and tribulations confronting us. INDIAN-ZIONIST FALSE FLAG TERROR OPERATION: THE EVIDENCE. INDIAN HINDU BJP FASCISTS DESPERATE FOR VOTES IN THE FORTHCOMING 2019 INDIAN ELECTIONS RESORT TO USING ANTI-PAKISTANI AND ANTI ISLAMIC CARD. ALL ANTI ISLAMIC PROPAGANDA WILL BE DECONSTRUCTED AS WE APPROACH WW3. PREPARE FOR GHAZWA I HIND FRONT OF ISLAMIC ESCHATOLOGY. CHECKOUT THE MOSSAD SPECIAL ASSASSINATION UNIT "KIDON". HAQEEQAT TV POINTS THE FINGER ON THE HAND OF KIDON IN THE TERROR ATTACKS IN IRAN AND INDIAN OCCUPIED KASHMIR. THE ATTACK IN IRAN TOOK PLACE AT THE START OF THE ANTI IRANIAN SECURITY CONFERENCE IN POLAND WHILST THE INDIAN ATTACK TOOK PLACE DURING MBS 20 BILLION INVESTMENT VISIT IN PAKISTAN. WHO WOULD LIKE TO DIVIDE A SUNNI V SHIA POWER and SET ALIGHT HINDU INDIA AGAINST ISLAMIC PAKISTAN? IT CAN ONLY BE OUR ZIONIST FRIENDS. INDIAN AND PAKISTANI ANALYSTS AGREE THAT RAW CHIEF AJIT DOVAL MASTERMINDED THE PULWANA ATTACK AND CAN ONLY BE VIEWED AS ANOTHER INSIDE INDIAN JOB LIKE URI AND PATHANKOT ATTACKS. THIS STATE OF AFFAIRS BETWEEN 2 NUCLEAR POWERS IS DANGEROUS AS IT IS BEING USED TO FUEL ISLAMOPHOBIA AGAINST KASHMIRI AND INDIAN MUSLIMS AND A CASSUS BELLI AGAINST PAKISTAN. MINORITIES ARE BEING FORCED TO PROVE THEIR PATRIOTISM TO THE INDIAN STATE. ALSO INDIA WANTS TO END THE NEW GEOPOLITICAL RISE OF PAKISTAN. THE PRO PEACE MOVE BY IMRAN KHAN TO OPEN THE KARTARPUR CORRIDOR AND GATEWAY BETWEEN INDIAN AND PAKISTAN PUNJAB IS BEING SABOTAGED BY INDIAN HINDU FASCISTS. AND EXPOSE THE PEOPLE AND FORCES WHO ARE ENGAGED IN TREASON AGAINST THE STATE. LOYALTY TESTS ARE A SIGN OF HOW THE NWO OPERATES. WE NEED TO EXPOSE THE ENTIRE MILITARY INDUSTRIAL SECURITY INTELLIGENCE APPARATUS AND MAKE IT ACCOUNTABLE. UNITED PAKISTAN CIVIL-MILITARY LEADERSHIP READY TO RESPOND MILITARILY TO INDIAN VIOLATION OF LINE OF CONTROL TO COUNTER ATTACK INDIA IN INDIA OCCUPIED KASHMIR TO ASSERT RIGHT OF SELF DEFENCE. THE MODI REGIME IS DESPERATE FOR WAR BEFORE FORTHCOMING INDIAN ELECTIONS TO SWEEP INDIAN ELECTIONS. IF THIS CRISIS TRANSFORMS INTO THE ESCHATOLOGICAL GHAZWA I HIND THE FLAG OF PAKISTAN AND THE BLACK FLAG OF ISLAM WILL END UP FLYING OVER NEW DELHI. LET THERE BE NO DOUBT THAT INDIA WHICH IS A SUPERPOWER IS IN THE PROCESS OF A FULL STATE OF WAR AND ACTING BELLIGERENTLY AND HAS CROSSED A RED LINE IN KASHMIR. PAKISTAN IS IN A STATE OF WAR AGAINST AN INDIAN HINDU FASCIST REGIME WHICH WANTS TO BREAK IT INTO 4 PIECES. THE DIRE SITUATION IS ANALOGOUS TO THE FAMOUS BATTLE OF BADR WHEREIN THE EARLY MUSLIMS ALTHOUGH OUTNUMBERED MORE THAN 3: 1 OVERCAME THE HOSTILE NONMUSLIM PAGAN ARMY. THE SITUATION HERE IS MORE THAN 6:1. HOWEVER SUCCESSFUL MUSLIM ARMIES IN HISTORY WERE NEVER SWAYED BY STATISTICS AND BATTLES WERE INSPIRED AND EMBARKED ON THE BASIS OF AND FOR THE FAITH AND DIVINE LAW. THE ONLY PRACTICAL SOLUTION TO THIS PROBLEM IS TO DESTROY THE LAST EVIL DIVISIVE VESTIGES OF THE BRITISH RAJ. ARE THE BRITS AWARE THEY ARE CULPABLE IN THE DOCK OF HISTORY FOR THIS CRISIS AND IF THEY ARE NOT IT IS TIME THEY PAID ATTENTION ON THEIR LIABILITY. ARE WE AWARE THAT THE REAL STORY OF THE PARTITION IS EVEN MESSIER THAN THE OFFICIAL NARRATIVE. WE NEED TO REFLECT ON THE FACT THAT THE INITIAL MILITARY COMMANDER OF THE NEWLY FORMED STATE OF PAKISTAN WAS A WHITE BRITISH ARMY OFFICER WHO REFUSED TO TAKE ORDERS FROM JINNAH THE FOUNDER OF PAKISTAN AND GOVERNOR GENERAL. JINNAH'S ORDER FOR THE NEWLY CREATED PAKISTAN ARMY TO BE SENT IN TO LIBERATE KASHMIR WAS REFUSED. TRIBAL PATHANS AND AFGHANS OBEYED HIS ORDERS AND INVADED KASHMIR AND LIBERATED UP TO 40% OF THE AREA AND WERE ON THE VERGE TO CONTROL THE ENTIRE REGION. THEY WERE THWARTED BY THE INTERVENTION OF THE INDIAN ARMY. IF THERE WERE NO DELAYS AND IMMEDIATE EXECUTION OF HIS ORDERS KASHMIR WOULD HAVE COME UNDER PAKISTAN'S CONTROL AND THE REST WOULD BE HISTORY. BUT IT HAS REMAINED THE LONGEST INTERNATIONAL DISPUTED TERRITORY BETWEEN 2 STATES. AS INTERNATIONAL LAW HAS NOT BEEN UPHELD, HUMAN RIGHTS HAVE BEEN VIOLATED AND TRAMPLED UPON AND THE UN DYSFUNCTIONAL THERE IS AN URGENT NEED FOR AN ALTERNATIVE SOLUTION. THIS CAN ONLY MEAN SELF DEFENCE TO SECURE THE REALM AND NATIONAL SOVEREIGNTY BY ANY MEANS NECESSARY INCLUSIVE OF WAR TO LIBERATE AN OPPRESSED PEOPLE. THIS CRISIS HAS ALL THE REQUIREMENTS TO BE TRANSFORMED INTO THE ESCHATOLOGICAL GHAZWA I HIND WHICH WILL RESULT IN THE FLAG OF PAKISTAN AND THE BLACK FLAG OF ISLAM ENDING UP FLYING OVER NEW DELHI. THOSE WHO ARE IGNORANT ON THE HISTORY OF ISLAM IN HINDUSTAN- INDIA NEED TO RECALL THAT IN 711 AN ISLAMIC RULER RESPONDED TO THE PLEA TO RESCUE MUSLIM TRAVELLERS KIDNAPPED AND TRAPPED IN THE SINDH REGION. HE RESPONDED AND ISLAMIC HISTORY AND LAW DEMANDS NOW THAT THE UNIVERSAL HUMAN RIGHTS OF KASHMIRIS BE UPHELD AND THE OPPRESSOR CONFRONTED NO MATTER THE COST- THIS IS JIHAD AGAINST A NWO PHARAONIC KUFR SYSTEM BASED ON THE DOCTRINE THAT MIGHT IS RIGHT. ITS DAYS IN HINDUSTAN ARE NUMBERED AND THE COUNTDOWN COMMENCES NOW. INDIAN SURGICAL STRIKE ..START OF GHAZWA I HIND? CAN THE KASHMIR CONFLICT EVER BE RESOLVED ? THE INDIAN SUBCONTINENT IS ON RED ALERT AND A FULL SCALE WAR CAN BREAK OUT ANY MOMENT. THIS WILL DESTABILISE THE REGION AND WORLD. ALSO ISLAMIC ESCHATOLOGY OUTLINES THAT IN THESE TIMES A WAR CALLED GHAZWA i HIND : THE BATTLE FOR INDIA WILL TAKE PLACE. IF YOU DON'T KNOW THIS WORD IT IS TIME YOU TAKE A CRASH COURSE ON IT AND IT'S SIGNIFICANCE AND IMPLICATIONS. GHAZWA i HIND SHOULD BE A COMMONPLACE WORD IN THE ENGLISH LEXICON LIKE CHICKEN TIKKA MASALA AND WOULD BE A GREAT NEW ENTRY TO THE ENGLISH LANGUAGE. THE RECENT EVENTS IN THE HIMALAYAS REVEAL THAT THE WRITING IS ON THE WALL. THE GLOBAL WAR OF TERROR AGAINST ISLAM IS RESORTING TO PRE-EMPTIVE STRIKES ON A SOVEREIGN STATE LIKE PAKISTAN BY INDIA. PAKISTAN IS A STRONGHOLD OF ISLAM IF NOT THE LAST FORTRESS IN A DARK ERA OF GLOBAL ISLAM. THE DEBATE ON THE PERMANENT WAR OF TERROR IS AT A GLOBAL CROSSROADS. WE NEED TO COME CLEAN ON THIS PHONEY WAR OF TERROR AND END THE SUBVERTION OF THIS WAR BY NONMUSLIM POWERS SEEKING HEGEMONY. PAKISTAN WAS CREATED ON THE VISION OF ISLAMIC IDEOLOGY AND HAS THE MOST POWERFUL MUSLIM ARMY AND IS A NUCLEAR POWER WITH BATTLE HARDENED ARMED FORCES. IT IS NOT PREPARED FOR IT's NATIONAL TERRITORIAL SOVEREIGNTY TO BE VIOLATED. IT IS A NATION WITH A TURBULENT HISTORY FORGED IN THE FIRES OF SACRIFICE AND HAS A MANIFEST DESTINED ROLE OF LEADERSHIP TO PLAY IN GLOBAL ISLAM. IF IT IS ATTACKED A GLOBAL JIHAD FOR FREEDOM AND SELF DETERMINATION WILL HAVE TO BE ANNOUNCED AND LAUNCHED. THE VIDEOS BELOW COMPLETELY EXPOSE INDIAN MILITARY INTELLIGENCE FOR THE FALSE FLAG PULWAMA ATTACK ON THE INDIAN ARMY. MODI IS A HINDU SUPREMACIST AND ISLAMOPHOBE WHO UNDERSTANDS FORCE AND MIGHT. HIS CAREER STARTED IN A HINDU TERROR ORGANISATION AND WAS LAUNCHED WITH THE TERRORISING OF GUJRATI MUSLIMS IN A POGROM AND THE ONGOING OPPRESSION OF KASHMIRI MUSLIMS. ON THE BASIS OF MODI's LOGIC THERE SHOULD BE PAKISTANI PRE-EMPTIVE STRIKES ON INDIA FOR VIOLATING INTERNATIONAL LAW, COMMITTING GENOCIDE AND WAR CRIMES. TO DATE THIS HAS BEEN PREVENTED DUE TO THE DETERRENCE OF NUCLEAR WEOPONS ON BOTH SIDES. AS BOTH COUNTRIES ARE IN A STATE OF BELLIGERENCE IMRAN KHAN SHOULD HAVE MODERATED THE SPEED AND HASTE OF RELEASING THE CAPTURED INDIAN POW. HE SHOULD HAVE NEGOTIATED AND EXCHANGED HIM FOR RELEASE OF IMPRISONED KASHMIRI LEADERS AND ACTIVISTS. THERE SHOULD HAVE BEEN A QUID PRO QUO. THERE SHOULD BE A DECLARATION ISSUED TO THE WORLD THAT THE MUJAHIDEEN WHO FIGHT FOR FREEDOM AND SELF DETERMINATION ARE NOT TERRORISTS AND JIHAD IS AN UNIVERSAL LEGITIMATE RIGHT TO FIGHT TO RECLAIM THEIR RIGHTS. ISLAMIC HISTORY WHICH WITNESSED THE RISE OF KHWARIJITES OR THE LATTER DAY SALAFI WAHABBI TAKFIRIS AKA THOSE IN OUTFITS SUCH AS THOSE IN ISIS IS ANOTHER MATTER. THIS DISTINCTION WILL BE CLARIFIED AND IS ABSOLUTELY NECESSARY AS ENEMY INTELLIGENCE AGENCIES AND MASS MEDIA HAVE DELIBERATELY CONFUSED AND BLURRED THE DIFFERENCE BETWEEN JIHADIS ENGAGED IN JIHAD AND TAKFIRIS ENGAGED IN TERRORISM. JIHAD AND TAKFIRISM ARE NOT THE SAME INDEED THEY ARE COMPLETELY OPPOSITE. IN EARLY ISLAMIC HISTORY WARS WERE LAUNCHED TO ELIMINATE AND CRUSH THEM FROM THE RANKS OF MUSLIMS. THE BEST RECENT EXAMPLE OF THIS HAS BEEN THE WAR AGAINST TAKFIRI TERRORISTS SUCH AS THE PAKISTAN TALIBAN TTP WHICH HAS BEEN DESTROYED BY THE PAKISTAN ARMY. THIS GROUP IS VERY DIFFERENT FROM THE AFGHAN TALIBAN AND SHOULD NOT BE CONFUSED. THE POWERS THAT BE NEED TO BE WARNED UPFRONT THAT EVERY UNJUST ACTION IS BEING LOGGED AND ACCOUNT WILL BE TAKEN BY THE COMING BLACK FLAG UNITED STATES OF ISLAM ARMY LED BY THE IMAM MAHDI. RIGHT NOW THIS IS THE ONLY ACTOR MISSING ON THE STAGE OF HISTORY. THE BATTLE FOR INDIA WHICH HAS BEEN SIMMERING HAS STARTED TO COMMENCE NOW. THE FUSE HAS BEEN OCCUPIED KASHMIR BUT THE CAUSE IS THE RISE OF HINDUTVA IDEOLOGY AND HINDU FASCISM. Indian exposes Modi’s false flag attack in Pulwana. So an Indian Hindu fascist is exposed for showing allegiance to his fascist BJP party at the expense of the integrity and loyalty to the Indian State. The Inside and Details About the Others. IAF Haqeeqat TV claims that there are other missing Indian fighter pilots which neither Indian or Pakistan is talking about. No evidence produced of any terror camp in Balakot nor any destruction of 350 terrorists in Pakistan which has ignited the Indian Hindu nationalists. The Indian airforce was forced back by a prepared Pakistani air force. No evidence of 350 so called terrorists. Only evidence of eco-terrorism . Indeed the main casualities have been 10-15 fallen trees destroyed and ground soil damage and one dead bird. Also bombs dropped at Jabba miles from Balakot. Pakistan ace pilot hero states the media had barely given 30% of the truth on casualties suffered by the IAF. In a fullscale war PAF is ready to decimate the IAF . HOW PAF CRUSHED INDIAN AIR FORCE | AIR CHIEF REVEALS THE "SECRET"
WHAT WONDERS DOES PAKISTAN's JF-17 THUNDER HOLD ? Mubasher Lucman argues that the Indian propaganda of Pakistan being a supporter of terrorists is totally baseless and false indeed it has been a victim of terror groups( backed USA,India and Israel) engaged in proxy war. The PAF has shown its superiority over the IAF and many Gulf States and Muslim countries will look increasingly to Pakistan as their first choice of defence. Western defence contractors monopoly in arms sales is coming to an end. Good bye and good riddance. Zaid Hamid argues as Pakistan has air superiority over the Indian air force the IAF is not flying near the line of control and Indian military morale is low. Argues that PM Imran Khan should leverage his position and extract political and military concessions with the Indians such as ending Indian army atrocities in Kashmir, releasing Kashmiri POWs languishing in occupied Indian Kashmir prisons, ending of military curfews . And only then should any Indian POW be released. Pakistan has not capitalized gains on the diplomatic level. The despicable mean Indian psychology reveals itself when Pakistans peace initiatives are being sabotaged. Peace is rewarded immediately today with 7 Kashmiris killed by opening up of 150mm artillery fire at the LOC. Wants to change Pakistans military doctrine and go on the offensive to secure liberation of Kashmiri oppressed people seeking self determination and independence. CAPTURED ISRAELI PILOT IS TIP OF ICEBERG OF FORTHCOMING AXIS OF EVIL PLANS FOR WAR AGAINST PAKISTAN. THE 2 FRONT WAR MENTIONED IN ISLAMIC ESCHATOLOGY IS NOW COMPLETE. THIS WILL BE THE FOCUS OF ATTENTION HEREWITH AS THE GLOBAL ISLAMIC RESISTANCE TO USA-ISRAELI NATO AND INDIAN HEGEMONY IS STARTING. THIS WILL BE LINKED TO SHIFTING ALLIANCES AND EMERGENT BLOCS INCLUSIVE OF RUSSIA AND CHINA. Haqeeqat TV claims that India plus 3 other States namely USA-ISRAEL and Afghan puppet regime are planning a proxy war using all assets at their disposal. It warns that Pakistan and its armed forces are on full alert and this time will hit back ferociously including direct attacks on Indian armed forces in India. WHY INDIA IS ANXIOUS TO HAVE A WAR WITH PAKISTAN? Anchor claims its not just about territorial geostrategic importance. There are 30 separatists movements alone in India. Trade wars with a rising superpower China. Its about India's future and they have no choice but to attack as Make India Great Again wants to expand at the incorporation of Pakistan into Greater India or its dismemberment. Zafer Ali Hillali ex Pakistan FM claims we have an Israeli pilot brought him down and he is captured. USA has been asked by Israel about him. Israeli jv with India to denuclearize or damage nuclear assets Pakistan by having an IndoPakistani war. Powers want a limited war not nuclear war and An Arab Israeli war with a bid for a Greater Israel. USA and Israel want and are assisting total war being planned by India on Pakistan so they can destroy Arab power unopposed. This will Continue for 6 years. INDIA AND ISRAEL TOGETHER AGAINST PAKISTAN? Haqeeqat TV claims 4 Indian fighter jets were shot down by the PAF. Pakistan claims 2 officially and the Indians claimed 1 officially. The true facts have not yet been disclosed. Haqeeqat TV claims that spiritual warfare has to be factored in when Muslim and nonMuslim armies fight . On February 26 2019 the IAF Mirage 2000 jets fired several 1000 kg SPICE 2000 bombs into what they called a “ terror training camp” in Pakistan. The strike targeted the militant terrorist organization Jaish-e-Mohammed's centre which turned out to be a school in Balakot. Video evidence by Pakistan proves that no such camp existed and missiles missed the target. The payload was released in haste on a mountainside in Jabba 40 Km away. Israeli made Rafael Spice 2000 guided missiles were used in which navigational and optical sensors which match onto the target image. There is a 0% chance of missing targets when the missile is released. As the targets are never missed this means that ALLAH SWT used spiritual forces to deny the air strike and the mission was aborted preventing a full Indo Pakistani war erupting which was the Israeli plan. This is a sign that a big regional if not world war is imminent in which the spiritual factor may prove decisive. No direct war all out between Indian and Pakistani armies since 1965 war as there is a fear of spiritual warfare being directed at India in combat. This is known and understood in the modern military industrial security intelligence nexus. Nonmuslim powers are using agencies such as DARPA or Satanic black magic to be used in warfare against Pakistan. EVM machines are going to be used to hack electronic voting to hijackelections to re-elect Modi with a majority to execute. If he comes back an Indo Pakistani war is imminent as the Greater Israel NWO plan is in motion. If Modi is successful be prepared for war. Haqeeqat TV claims that THAAD has been introduced into Israel in preparation for the forthcoming 2 front war in the Middle East and South Asia. Israelis claim it is to protect against Iranian missiles. But it can only be ready for conflict with the more sophisticated Pakistani missile technology. PAF captured Israeli made Spice 2000 missiles which the IAF's Mirage 2000 released to lighten their overload as Pakistan's JF 17 were about to attack them. PAF will master this technology. Israel will regret giving this hi-tech to the IAF.